As far as I know, Thai and other asian sprouts are usually mung bean or soybean. 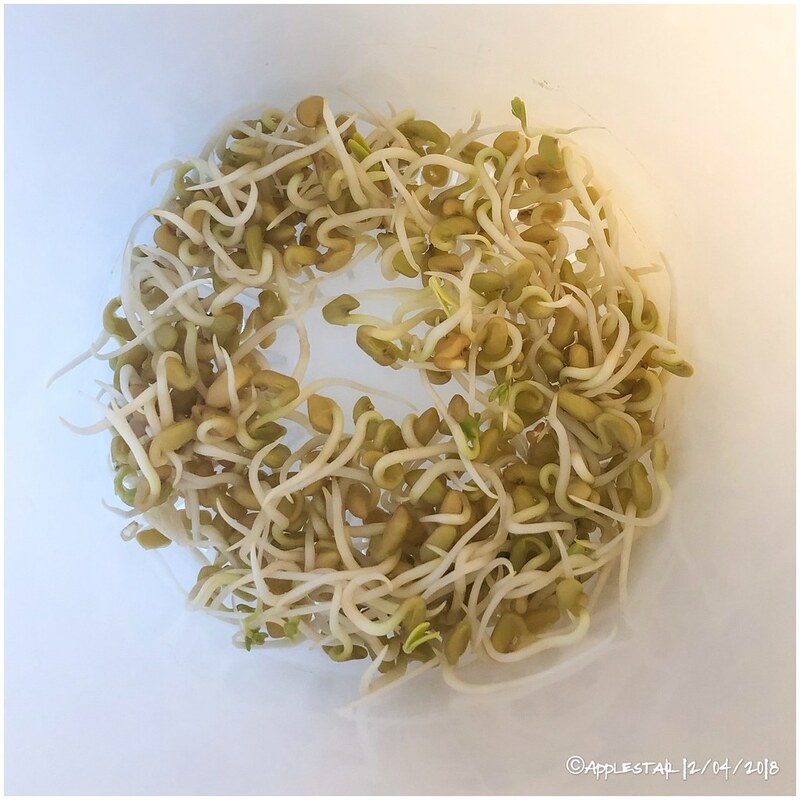 Some are more suited to sprouting than others and you want fresh seeds with good germination rate since spoiled dead seeds in the sprouts can be really off putting. Also, commercial seeds for growing in soil can be treated with fungicides and pesticides so you want to be careful about that. I got to sproutpeople website for reference. They have a HUGE library of information there on how to sprout, flavor, etc. you can buy seeds from there, too, and selection is excellent -- I would probably buy things I can't get anywhere else... but they are based in the West coast -- I think San Francisco? -- and I try to buy from local shops and stores when feasible. 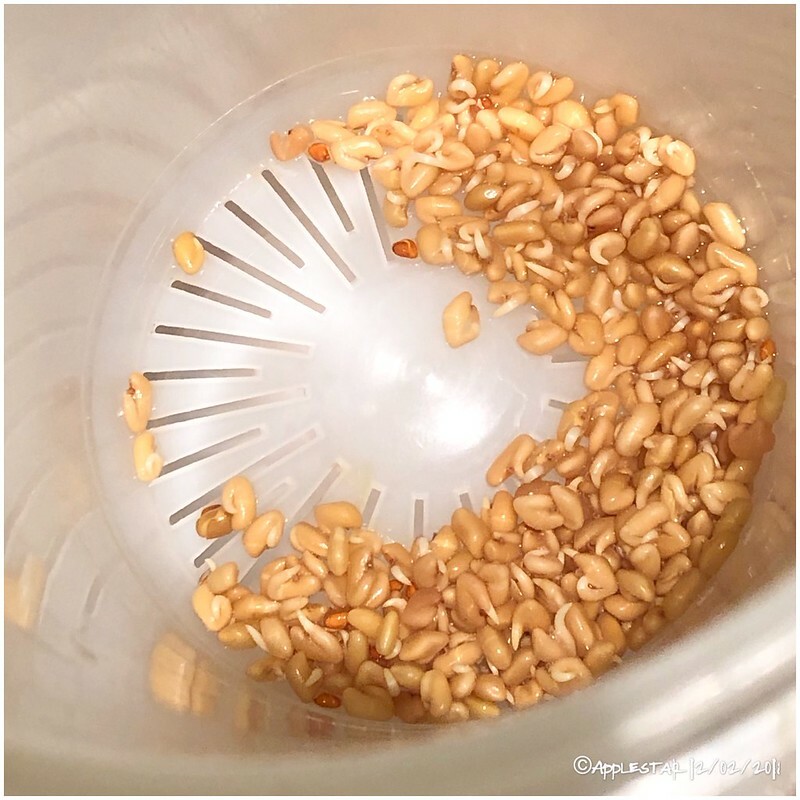 I germinated a mix of organic short grain brown rice from a Korean supermarket) and hulled (but NOT pearled) barley purchased from bulk section at Whole Foods). I can just pick out the barley which germinated faster and eat the sweet chewy grains, but I'm going to dry these and grind them in the food processor to use as quick cooking hot cereal. I'm definitely sprouting the barley separately next time for snacking on since the rice was slower to sprout and as it is, is starchy to eat like this. I haven't tried them but lentil sprouts are supposed to be good, too. I used the weighted cup method someone described recently. I thought it was in here, but it's not so I'm going to have to go hunt for the link. I often sprout beans just to about the size of the bean, and use them in Indian curries. My favorite for this is the red chori bean. The adzuki is often listed as a synonymn for this, but the adzuki is smaller, darker, and shinier, so they seem totally different to me. Both delicious, however, though I've never tried making full sized sprouts with them - I'll have to try it. I'm going to have to try this as well. Maybe the Indian varieties are larger like the Dainagon from Kyoto listed at Kitazawa Seeds (note the number of seeds per packet). That would kind of make sense as Kyoto is in a warmer, protected region of Japan and culturally influenced by Buddihsm -- perhaps including seeds that might have been imported at some point. It has been 10 years since I made sprouts. I never had any trouble as long as I rinsed my seeds several times every day. If the wet seeds sour they rot or mold so you need to rinse them often. I use quart mason jars with window screen wire over the jar end to keep the seeds in. Rubber band or mason jar ring works good to hold the screen in place. Every morning at breakfast all the jars get about 1/2 full of water then poured out. I do that again at lunch time, dinner time and bed time. I keep the jars near the kitchen sink only because that is where the water and sink are. Sun light comes in the window so sprouts are slightly green. Sprouts will get very large and compact the jars so tight they wont dump out so you have to dig them out. I put in less seeds that makes sprouts easier to get out but then it takes 2 jars of sprouts to equal 1 compacted jar of sprouts. I buy seeds from farmers coop. These are farm grade seeds used to plant fields or feed to animals. Some seeds like beans are coated with pink color anti fungus stuff for planting I never buy pink seeds. There is a packaging company in Smyrna TN that buys seeds in railroad car size loads and repacks them in small bags. When the factory starts running a certain seed through the packing line they put the same seeds in a dozen different packages for a dozen different customers. Some are packed in organic packages and some are not but they are the same seeds. I bought beans there a few times they were cheap $10 for a 50 lb bag. I have very good luck with farmers coop seeds they come in large bags 20 lbs, 30 lbs, 40 lbs and 50 lbs. Last time I bought flax seeds they came in 40 lb bags. Last time I bought alfalfa seeds they came in 20 and 50 lb bags. I need to make a special place to sprout seeds 15 mason jars get in the way on the kitchen country top. We were eating sprouts as salad and in stir fry for about 2 years. It takes about 4 days to get good size sprouts, if we each 3 jars a day we need a total of 12 jars depending on the temperature inside the house. I grow mostly alfalfa, and one tip for them is to grow them dark/shaded or in sunny/light position the last mentioned will give the green chlorophyll and can taste quite different. Bumping this... I haven’t started the winter season sprout growing yet, but I will be soon. I find fresh sprouts are not too difficult to grow during the colder months. It’s harder when room temperature gets in the low 70’s and nearly impossible to keep up in high 70’s. Can E.coli be carried inside the seeds, or would a preventive practice to extra wash or treat the unknown seeds first be sufficient? hmm ? Since we moved to the smaller house with smaller kitchen it is hard for me to make sprouts. I have very good luck with dried grocery store beans & lentils. Navy beans are much better than Great Northern beans. Kidney beans are good too. All 3 colors of lentils are good. I bought a 50 lb bag of Flax seed from farmers Co-op they made good sprouts. I save water melon seeds and cantaloupe seeds from melons they make good sprouts. Farmers Co-op sells soy beans 50 lb bag is $20. Soy bean hulls are thick and slow to sprout they also make good soy milk and Tofu. Sprouts are a good substitute for lettuce, salads, on sandwiches. Barley is 1 of my favorites once the seeds have a tiny sprout about 1/8" long sprinkle them on several cookie sheets bake them in the kitchen oven. Bake temperature determines the flavor. Heat caramelizes starch in the grain it turns to sugar. Bake at 325 not much flavor, bake at 350 grain turns a bit golden brown you get a better flavor, bake at 375 you get a darker golden brown color with a very good Carmel flavor, 400 degrees gives you a dark color with a different flavor, 425 darker with better dark type flavor, 450 gives you almost a burnt look with another type flavor. This is how crystal malt is made do a Google search, how to make crystal malt. Grind up the dry barley grain to flour it makes the very best home made bread with a very good flavor. I add 1 cup barley flour to a bread recipe for flavor someones add whole grain crystal malt barley to bread. I wish there was a factory made sprout machine about the size of a microwave oven to make sprouts automatic and easier. Last edited by Gary350 on Sun Nov 25, 2018 12:11 am, edited 1 time in total. I like sprouting barley, but usually just to put in soups - never made my own malt, but it sounds tempting. One of my favorite beans to sprout is a red chori bean - a.k.a. adzuki. Another is the black eyed pea. If I can plan enough in advance, I often sprout these before putting them in soups or curries. I discovered I had some fenugreek seeds. They are getting old, I think... but I started a test batch yesterday. Ready to snack fenugreek sprouts. They are tasty but pretty mild to me, not at all an unusual flavor. The seed hulls are not objectionable. They can be greener, but I’m detecting occasional bitterness as it is. Do they turn bitter when green? Or do the hulls impart the bitterness? My family won’t eat anything least bit bitter, so I guess these are all mine. ...found the new bag of organic adzuki beans and started a small batch.